Warning: This book contains one ex-con/ex-heiress with a pet zombie parakeet who lives next door to her ex-army/ex-crush. Brace yourself, we’re talking more exes than a pirate treasure map here. 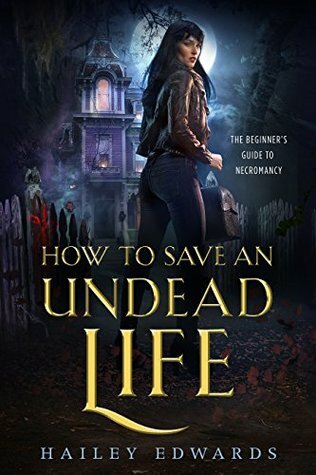 How to Save an Undead Life is a brand new series by Hailey Edwards. I fell into the mystery and dramatic adventure of who and what Grier Woolworth is. WOW I’m not sure where to start. This book is setting us up for one amazing adventure. Grier is thrown into the deep end and is not prepared for it. I felt for her. She’s one hot mess with some serious PTSD. You might wonder what happened, well lets just say her past is a tragic one and she didn’t have a chance. She also doesn’t know her background, has gifts she doesn’t know about, and everyone wants a piece of her. It’s a emotional roller coaster ride for the reader and Grier. I liked the characters introduced and found them intriguing. The few friends Grier has are solid. I think she’s going to need those friends in the future. I absolutely loved her house, Woolly. Most think the house is haunted, but I think it’s more. The house is the only thing she has left of the caregiver she adored. We also meet Boaz, the neighbor boy and her long time crush. I’m not sure what is going on with these two. They where/are friends and may have been more if the events from her past hadn’t happened and now who knows where things will go. This one is field with question’s, answer’s, mystery’s, more question’s, and some nasty stuff that Grier isn’t prepared for. I couldn’t put How to Save an Undead Life down and I’m excited to see what happens next. *Disclaimer: I received a complimentary copy provided by Hailey Edwards with the sole purpose of an honest review. All thoughts, comments and ratings are my own. Oh this one looks like something I could really enjoy as well and I love the cover! thanks for sharing! It was a great UF. I had fun and can’t wait for more. Hope you enjoy! Awesome review Angela!! On my tbr gr list!! Shared on my socials! Glad you enjoyed my review and thank you for sharing! This one sounds like a lot of fun! A parakeet? Interesting! It is a lot of fun, different and unique. I really enjoy Ms. Edwards books. They take me on an adventure and pull me into the characters lives. Thank’s for stopping by.